Jimmie Johnson won the 11th Annual AAA Texas 500, his 75th victory in 505 NASCAR Sprint Cup Series races. This is his fifth victory and 20th top-10 finish in 2015. This is his sixth victory and 19th top-10 finish in 25 races at Texas Motor Speedway. Brad Keselowski (second) posted his sixth top-10 finish in 15 races at Texas Motor Speedway. It is his 23rd top-10 finish in 2015. Kevin Harvick (third) posted his 14th top-10 finish in 26 races at Texas Motor Speedway. Brett Moffitt (30th) was the highest finishing rookie. Jeff Gordon leads the point standings by 2 points over Kyle Busch. Jimmie Johnson becomes the first driver to win three consecutive NSCS races at Texas Motor Speedway. Jimmie Johnson has won the last four consecutive Chase races at Texas Motor Speedway. Jimmie Johnson has 75 career wins in the NASCAR Sprint Cup Series, just one win behind NASCAR Hall of Famer Dale Earnhardt (76). 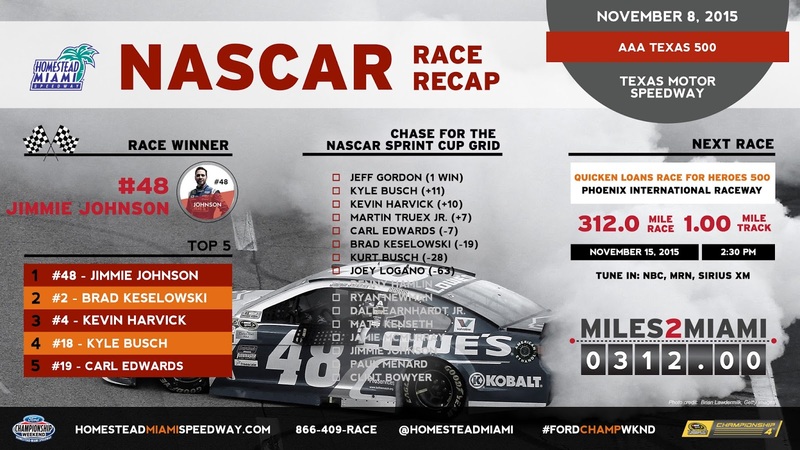 Jimmie Johnson is the third driver in series history to sweep both races at Texas in a single season joining Carl Edwards (2008) and Denny Hamlin (2010). With the completion of the AAA Texas 500, there are only 312 Miles2Miami.